Earlier called Train 18, the indigenously built train is set to be flagged off by Prime Minister Narendra Modi on February 15 from the New Delhi Railway Station. Vande Bharat Express, India's fastest train, has reduced its fares a day after the pocket pinch for the country's first engineless train was announced. The Delhi-Varanasi train will now have a reduced fare of Rs 1760, down from Rs 1850, for chair car and Rs 3310 instead of Rs 3520 for executive class, a railways order said today. On the return journey, the chair car ticket would cost Rs 1,700 and the executive car ticket will be priced at Rs 3,260, a railway order said. Earlier, the chair car ticket was priced at Rs 1,795 and the executive class ticket was priced at Rs 3,470. The train also has differently priced meals and fares are inclusive of catering charges. The 16-coach train will replace the 30-year-old Shatabdi Express and will run between Delhi and Varanasi. The previous chair car fares were 1.5 times the base price of Shatabdi trains running the same distance, the executive class fares were 1.4 times that of the base fare of first class air conditioned seating in the premium train. The revised fares have brought it down by 0.1% for both cases. 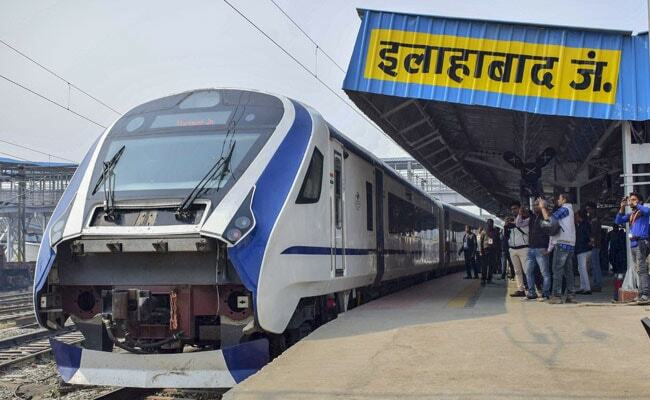 The ticket fares between Delhi and Kanpur will be Rs 1,090 instead of Rs 1,150 in the chair car and Rs 2,105 instead of Rs 2,245 in EC for a distance of 447 km, the order said. Between Delhi and Prayagraj, the ticket price for Chair Car class will be Rs 1,395 (instead of Rs 1,480) and Rs 2,750 (instead of Rs 2,935) for the Executive Car class. Between Kanpur and Prayagraj, the price for Chair Car will be Rs 595 instead of Rs 630, and for Executive Car it will be Rs 1,170 instead of Rs 1,245, the order said. The prices between Kanpur and Varanasi for a Chair Car ticket will be Rs 1,020 instead of Rs 1,065 and an Executive Car ticket will cost Rs 1,815 instead of Rs 1925. The train will cover the distance of 755 km in eight hours with stoppages at Kanpur and Prayagraj. It will be the fastest train on the route. The current fastest train takes around 11-and-a-half-hours to complete the journey. Manufactured by the Integral Coach Factory, Chennai, Vande Bharat Express became India's fastest train by hitting speeds of over 180 kmph during a trial run on a section of the Delhi-Rajdhani route. All the safety clearances, trials and tests are in place as well. Meals on the train will not be optional for passengers, unlike in premium trains such as Shatabdi, Rajdhani and Duronto express, where they can choose not to avail catering services, officials had said.